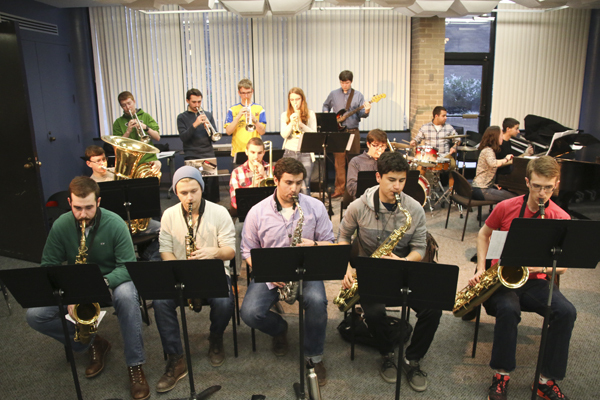 The GW Jazz ensemble is hosting a 24-hour-long concert on April 16 to draw attention to the music department's recent budget woes. International affairs majors don’t typically add “performs in a brat pop duo” to their resumes, but Liz Nistico and Louie Diller of the band Holychild graduated with the moxy to make an impact on either industry. Their zippy beats will come to music festivals like Lollapalooza, Governor’s Ball and Sweetlife Festival this summer. Last week, they spun at a SXSW party hosted by SPIN magazine, and their song “Running Behind” is featured in the first Apple Watch commercial, which the University touted in its newsletter. They credit their success to having a comprehensive education — an opportunity they say GW students who have a zest for music but different majors will now miss out on. They’re among some of the well-known alumni voicing their concerns about budget cuts they say will unfairly impact a tight-knit arts community on campus — which has produced impressive figures in the industry like the president of the National Academy of Recording Arts and Sciences, Neil Portnow, and actress Kerry Washington. Diller said to see the reasons he chose GW over equally prestigious colleges face drastic changes is “depressing” because it was through loosely organized music programs like weekly jam sessions, choral ensembles and music electives that he met Nistico. The University-wide budget crunch will strip about 5 percent from every division, though students and faculty say it will hit relatively small departments like music, as well as theater and dance, the hardest next semester. The cuts will halve the number of campus ensembles and reduce adjunct professors’ teaching hours. Non-majors and minors won’t be able to take private lessons. Freshman Zach Sanders is one of the co-founders of GW Jazz Orchestra and a member of other music groups on campus like the GW Wind Ensemble and GW Symphonic Band. “I’m ashamed. It’s embarrassing that this is happening. I can’t emphasize how important it is to have a well-rounded education, [especially] when you’re paying that much,” Diller said. Though Nistico was an honor-roll student who interned at the Embassy of Italy and studied abroad in Nepal, she said she would have transferred if it were not for the people she found in the arts community. She said she and Diller “totally milked GW for what it’s worth” because they were immersed in every aspect of a liberal arts experience. “I wasn’t even a dance minor. I just took as many dance classes as I could. I modeled for fine arts classes [where] I found the people I connected with,” Nistico said. On a Facebook group, GW Budget Cuts, dozens of students and alumni have posted stories similar to theirs: Many universities offer top-notch degrees, but few have music programs of GW’s quality and accessibility. Ben Thornewill, vocalist of alumni band Jukebox the Ghost, heard about the budget cuts from Holychild. He said by limiting music programs to majors and minors, GW will lose creative students and damage its reputation as an institution that supports the arts. Thornewill also said he would not have remained at GW had it not been for the music department, where bandmate and guitarist Tommy Siegel posted the “Wanted” ad that brought Jukebox together. But sophomore Julian Berkowitz and freshman Zach Sanders are spearheading the pushback against the new exclusivity of the music department. They, along with sophomore Stephen Arnold, have met with administrators and organized a 24-hour concert for April 16, which Jukebox the Ghost and Holychild hope to play. 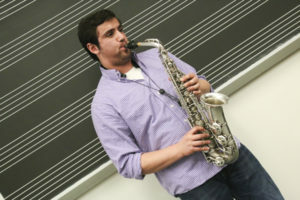 With his sights set on law school, Sanders, a history major and saxophonist, did not want to commit to an intense music program like the Mason Gross School of Arts. Rutgers University had offered the New Jersey native a scholarship, but he turned it down in favor of GW, where he could earn an academic degree and still continue his passion. Both Berkowitz and Sanders cited the music department, and the longest-running weekly jam in the District, as a comfortable space and a creative outlet as they waded through tough first semesters. 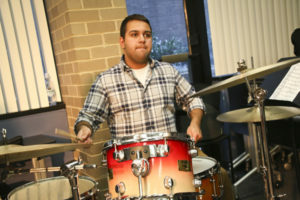 Julian Berkowitz, a sophomore majoring in political science, plays the drums for the GW Jazz ensemble, a music group he founded. Students are pushing back against the University’s recent cuts to the music department’s budget, which will eliminate multiple music programs. After Berkowitz attended his first Friday night jam session, he signed up for private lessons without a major or minor in music, which students like him will not be able to do in the fall. The political science major called the lessons “instrumental” in his decision to minor in jazz studies. Berkowitz said it’s easy to look at the number of music majors and write the department off as insignificant. He said the University is missing the number of students who participate in activities that don’t have formal enrollment, like the wind ensemble and jazz jams. “There’s no way to see the pedagogical significance of the jam session and private lessons on an Excel sheet. It’s a feedback loop,” Sanders said about the back-and-forth between collaboration and individual sessions. The inaccessibility of those programs will be detrimental to musicians’ ability to learn, said Raashi Kulkarni, an economics major and pianist who graduated in 2011. She also said that combining the high and low bands is like placing algebra, calculus and geometry students in the same math class. When Kulkarni, a Presidential Scholar in the Arts, was a senior, she visited the Steinway Piano Factory in New York with her piano professor and head of the music department to select which pianos would be donated to the University in 2010, one of which is the concert grand piano in Lisner Auditorium today. “There are plenty of conservatories in the country, but to have an academic institution be all Steinway? It was an exciting time,” she said. Kulkarni won an orchestra competition her freshman year and played a solo in Lisner. She would go on to play at the Smithsonian and the Inaugural Ball, and was introduced by Kerry Washington at an event. In her Commencement speech in 2013, Washington praised the theater and dance department, and spoke about playing a frog in a show her junior year. Elizabeth Nelson, a senior and double major in economics and international affairs, said in an email that the sense of harmony GW attempts to foster already happens naturally in the music department. “When biology majors sit next to engineers and politics majors [to] play music, they create exactly the kind of community the University is striving to create,” she wrote. Alumnus Dominic Martinez, who played alongside trumpeter Wynton Marsalis at an Americans for the Arts reception on campus in 2009, said the chance to play with the jazz icon was not as special as getting to know the other students on stage, who had a cornucopia of interests and aspirations. This article appeared in the March 30, 2015 issue of the Hatchet.